That question inspired Doreen Browne, owner of Oasis Hair Salon in Victorville, California, to take action. She came up with a plan to collect toys for children. Seven years ago, her salon gave a free haircut to anyone who brought in a new toy for a child. They collected 20 toys during the first year. Lisa was thrilled to deliver the gifts to some foster children that attended Liberty. 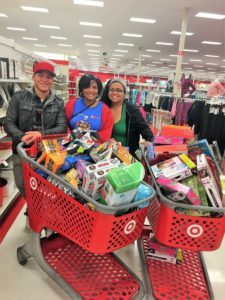 The following Christmas season, the salon held the same event and more than doubled the number of toys collected. Once again, they gave them to Lisa Ladao at Liberty Elementary. Browne’s simple plan to collect toys for needy children in the community began to grow. The salon raised $2,165.00 that year. The following year they raised $5,561.00 and added another school. 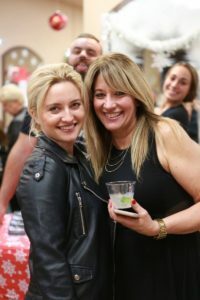 The event has steadily continued to grow in size and popularity with the clients and in the community, prompting other local businesses to jump on board. Stine Chiropractic, Freddy’s Frozen Custard and Steakburgers, Starbucks, Fight For It Crossfit, Ever Young Skin Care will donate to the charity event. The salon currently donates gifts to the following local elementary schools: Liberty, Village, The Academy, Morgan Kincaid Preparatory, Helendale, and Melva Davis Academy of Excellence. Toy shopping with the teachers. Doreen and her daughter, Katey-Bug Smith who also works at Oasis and helps with the event, meet with teachers from the schools to shop for the needy children after the event. They also buy beanies and gloves to attach to the gifts. From there, the teachers take the gifts home for wrapping then hand them out to the students. This year’s Client Charity Christmas Event will be held at Oasis Hair Salon at 13622 Bear Valley Rd. #8 in Victorville Tuesday, December 4, 5:00-7:00 p.m. When guests arrive, raffle tickets will be available for purchase at the door. Once inside, they can shop from the many local vendor booths while snacking on delicious homemade appetizers and cocktails made by Doreen Browne and Katie-Bug Smith. “Mom and I have a fun making everything for the event the day before,” said Smith. 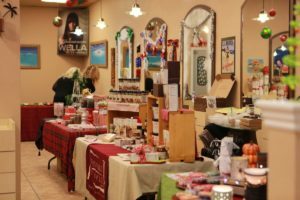 The vendors in participation for the event are Damsel in Defense, Skin Care by Baresknco, Gold Canyon Candles, Lularoe, Four Paws Creative Design with soaps, bath bombs and custom ornaments, Allie Morris Creations with wood crafts, Barbie’s Badges, Carry Your Cause with bags and purses, Dec+Honey with turban hats and baby goods, Home Interiors, local author, Beckie Lindsey, and, Frayed Cordz with handmade macrame goods. For the raffle, Oasis donates hair care baskets while the vendors provide product donations along with the contributions from local businesses to ensure some lovely prizes. In addition, Renee Browning, counselor for Oak Hills High School has contributed a beautiful homemade quilt each year. All the proceeds raised from the raffle go directly to the gifts for the children. “It’s a client appreciation night for us to say thank you for their loyalty while all the money goes to the children,” said Browne. Doreen and her daughter, Katey invite the community to come celebrate the holidays while participating in a great cause. For more information on Oasis Hair Salon look them up on Facebook or Instagram.